There are some inherent challenges to building a gunite pool and spa, so before you begin the process, our design professionals at IVY Studio, an aquatic design/build consulting firm based in the greater Boston metro area have compiled a basic guideline checklist for your consideration before meeting to design and build your new pool and spa. •	It is useful to create a portfolio of pictures of pools and spa’s that you like- shape, style and size. This will guide our design options. •	Review of all local building and conservation codes applicable- we will review in advance for you. •	Environmentally best options for equipment- we will update you on latest technology trends. •	Maintenance and cleaning options- we will review based on your needs. •	Safety issues- a critical part of the conversation which we will review with you. •	Expanding your outdoor environment- a pool and spa is usually just one of the building blocks in expanding your outdoor environment. We will review the options with you to create an all- inclusive design that incorporates outdoor dining options, landscaping, lighting, fencing and other features. 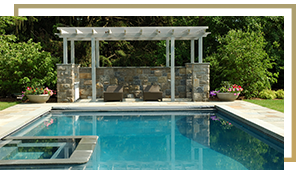 Contact us at 781-591-0300 or vern@ivystudioMA.com to schedule a no obligation consultation with our aquatic design professionals to start your pool and spa expansion project.